Highland Street Railway commenced operations on October 22, 1872. Its purpose was to directly compete with the Metropolitan Railroad that owned the horse car tracks south of Scollay Square in downtown Boston. Cambridge Railroad owned the tracks north of the Scollay Square, and access by other companies to these rail lines was mandated by state regulation. The Horse Railroad Wars were going on, with massive car blockades being a daily occurrence. Strings of horse cars of competing roads would clog up the narrow streets of downtown Boston, which would then spread out to various districts once outside the city center. Such bottlenecks eventually led to the consolidation of several horse car companies into the West End Street Railway in 1887, and later why the subways were built. Drivers would travel as quickly as possible on the inbound side, as to be at the front end of a blockade. Highland's competitive strategy was to purchase plush horse cars and provide the best service, to neutralize how passengers boarded competing cars in great congestion (people usually boarded the first of two cars heading to the same destination regardless of carrier). Many innovations were made by the Highland Line in an effort to gain traffic from the Metropolitan Railroad. Of course the main object of the promoters of the road was to make money, but they were much added by obtaining capital and franchises by popular feeling against the two pioneer railways [Metropolitan and Cambridge Railroads]. The public had some real grievances to redress, and in both cases, and the two old roads were making money, which in the public mind is a grievance itself. The terminal of the Highland Railway were Grove Hall in the Roxbury District, and Temple Place in the city proper. It was best equipped of the several street car lines, its cars being handsome specimens of this class of architecture and their bodies were ornamented with the conventional plaid of the Scotch Highlanders, in the center of which on either side was a panel representing some historical scene or a portrait of some of the Massachusetts governors for which the car was named. It was the first to uniform its employees, adopting for this purpose a gray cloth similar to that of the postal service letter carriers' uniforms. Highland was a well-managed corporation, exacting the strictest courtesy from its employees toward the patrons of the road, in return for which it paid liberal salaries and otherwise encouraged those who held subordinate positions. Its stockholders were mostly wealthy residents, among whom were many women. The incorporators were Moody Merrill, Samuel Little, Henry Pfaff, Jacob Pfaff, Donald Kennedy, and Charles G. Hayden. The principal tracks of this road were on Shawmut, Blue Hill, and Columbus Avenues, and Dudley and Warren Streets. This road is entitled to a large credit of the present park system of Boston, for it was almost wholly due to its influences that Franklin Park was purchased and laid out by the city; in fact, the whole Roxbury District was benefited and built up by its improved service. Its lines, however, were never very profitable until long after the company passed out of existence. Derived from a September 27, 1900 Boston Globe article. 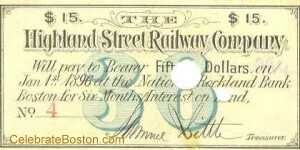 The Highland Street Railway Company eventually merged with the Middlesex Railroad in 1886 and became the Boston Consolidated Street Railway, which merged into the West End Street Railway in 1887.